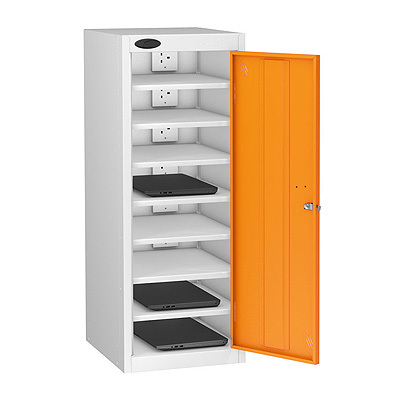 This 8 Shelf Charging Locker is ideal for charging up your electronic items with the peace of mind that they are locked up safe and secure. Great for items such as laptops, phones or small power tools. An ideal choice for charging up multiple two-dimensional electronic items in one location. 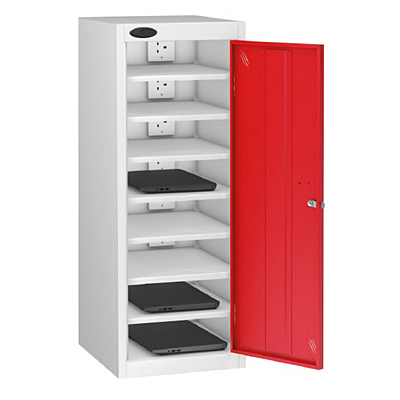 This 8-shelf charging locker guarantees peace of mind once locked up safe and kept secure. With Each shelf having their own plug socket, this charging locker offers businesses a compact location to store and charge their devices without the worry of floating wires, while the welded steel frame and strengthened door offers superb security. For sensitive environments, you would be happy to know that the antibacterial coating is effective at reducing MRSA and E-coli by 99.9%, helping to prevent contamination. Fitted with a standard cam lock but also available with a hasp and staple lock (for use of a padlock with a shank diameter of 7mm) at no extra cost. Easy storage solution - single door, multiple shelves, one key!